Customers exit the Wawa at 6th and Chestnut Streets during Wawa Day celebrations Thursday. The beloved convenience-store chain is planning to open its smallest-ever Philly store — at just under 3,000 square feet — at 16th and Chestnut Streets this fall. The store will be a “test nest" for new products and will include an exterior walk-up window. But don’t worry, it will still have a door for you to politely hold open for awkwardly long periods for other customers. Wawa's new "small store, big impact" design planned for 16th and Chestnut Streets in Center City, will include a walk-up window. 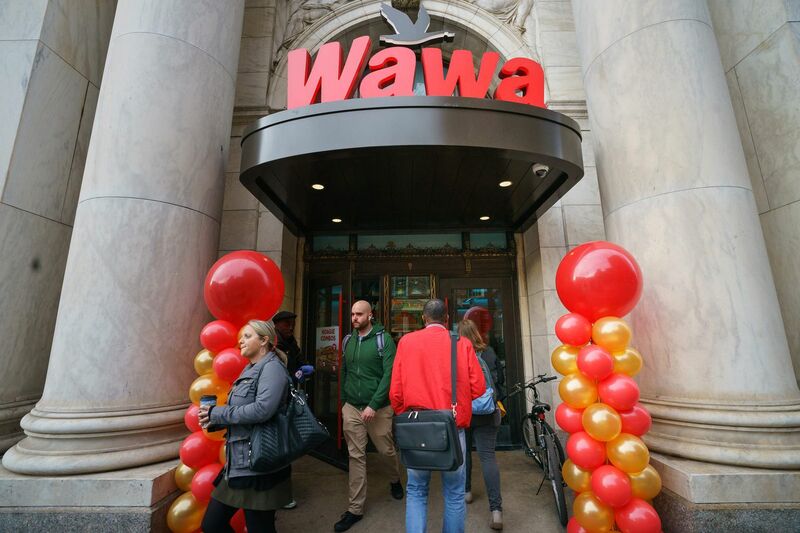 Wawa CEO Chris Gheysens unveiled plans for the wee Wawa during the chain’s annual birthday celebration, Wawa Day, which was held this year at its new flagship location at Sixth and Chestnut Streets. It was just last year on Wawa Day that Gheysens announced plans for the Independence Hall location, which became the Delaware County-based chain’s largest store, at 11,500 square feet, when it opened in December. Is Mother Goose Wawa testing the Goldilocks principle? Wawa has gone big. Now it’s going small. When is a Wawa just right? Gheysens says it’s not about the size — it’s about the feeling. “If we can crack that [smaller] model and still make it feel like a Wawa, then we might be able to move into core urban centers,” he said. Wawa's new store will be the smallest in Philadelphia at just under 3,000 square feet. The prototype store will be automated as much as possible, have a walk-up window for pickup orders, and new products like cold-pressed juices, energy shots, and “upscale hot tea” offerings. “What we hear first and foremost from our customers is they love how convenient we are, but they want it to be even more convenient,” said Terri Micklin, Wawa’s director of construction. An exterior rendering of Wawa's small and innovative store planned for 16th and Chestnut Streets. Former Eagles safety Brian Dawkins has tackled the challenge of creating a hoagie for Wawa, but you won’t be able to find it anywhere in Philly. Dawkins, a Jacksonville, Fla., native, created “The Dawk” hoagie — a wheat roll with grilled chicken, spinach, Parmesan cheese, tomato, pickles, sweet peppers, and honey mustard — to benefit the Police Athletic League of Jacksonville. The sandwich will debut at the opening of Jacksonville’s newest Wawa on April 16 and will be available only in that area. But Philly has a hoagie all its own too: the Broad Street Meatball, created by Zahav chef Michael Solomonov and Wawa chef Farley Kaiser. The two chefs went head-to-head Thursday in a competition to see who could make more of the sandwiches, which include Wawa’s garlic aioli, two kinds of cheese, and hot chili pepper relish. Zahav chef Michael Solomonov with the Wally Goose trophy he won in a hoagie-making competition against Wawa Chef Farley Kaiser, pictured at right. Mike Sherlock Wawa Vice President of Food Services, is pictured at center. Solomonov, the victor, said he had strong motivation to the win the Wally Goose trophy: his son. “He told me he really wanted me to win the trophy, so I felt like I had to,” he said. After Wawa Day last year, word spread of filmmaker Matthew Fridg’s intention to direct a full-length documentary called Sheetz Vs. Wawa: The Movie about the rivalry between fans of Sheetz, on the western half of Pennsylvania, and Wawa, on the eastern half of the state. This week, Fridg started a Kickfunder campaign to raise money for his film. Rewards for donating include having one’s name listed as Team Wawa or Team Sheetz in the credits, a Spotify playlist called “Convenience Store Jams," and a Team Sheetz or Team Wawa employee-style badge. In case you missed it, we have launched our Kickstarter campaign for "Sheetz Vs. Wawa: The Movie" (kickstarter page link in comments). I am excited for you to check out our Kickstarter video. This was tons of fun to make and it took a ton of great people all coming together to make it happen. Some of the video is stop-motion animation, some green screen, some incredibly cool footage shot by PA filmmakers. But overall, the video describes the essence of the film and the crowdfunding campaign. THE FILM In "Sheetz Vs. Wawa: The Movie", filmmaker Matthew Fridg sets out to settle the epic Pennsylvania convenience store rivalry debate once and for all and in the process learn why the fierce love of two convenience stores in Pennsylvania matters to people everywhere. But we need your help to make this film happen. Become a backer on Kickstarter by pledging support and choose from cool rewards like t-shirts, posters, VIP tickets to the premiere, and especially, a copy of the finished film when released. THE ULTIMATE FAN SHOWDOWN During this Kickstarter campaign we will let Democracy prevail. With your backing as your vote, you decide which team has more loyal fans...Team Wawa or Team Sheetz. One vote can make the difference. Don't let your team down. Share this Kickstarter video with your friends and family and on your social media platforms to get the word out. Talk about the movie while ordering your hoagie. Support your team. They need you. Thank you in advanced for your generous support in making this film. Every Wawa Day, the chain gives away two million free cups of coffee across all of its locations. In fact, people walked right through the Wawa Day news conference at the Independence Hall location Thursday to get theirs. Wawa also announced Thursday that its foundation was giving $1 million each to the Leukemia and Lymphoma Society, Philabundance, and the Special Olympics. (Left to Right) John Mitchell and Sharon Quarles, Special Olympics athlete leadership committee, meet Mayor Jim Kenney, at Wawa at Sixth and Chestnut Streets, on Wawa Day. The folks from the local branch of the Leukemia and Lymphoma Society were among the loudest and most excited of anyone at Wawa Day. Or perhaps they’d just consumed the most coffee. Nick D'Alfonso, left, and Domenico DeLaurentis, right, drink free coffee at the Wawa on 6th and Chestnut Streets during Wawa Day. Either way, Ellen Rubesin, executive director of the society’s eastern Pennsylvania chapter, said she’s a fervent Wawa fan.